The pilot episode of Edie Falco’s new Showtime series, Nurse Jackie (premiering June 8 at 10:30 p.m. ET/PT), has been available online for a couple weeks but I only got around to viewing it today. I’m glad I did. The show’s strong writing and acting are an antidote to all the trashy reality stuff on TV during the summer months. If I take one 30-minute dose of Jackie a week, maybe I won’t contract brain-rotting disease. But Jackie’s not mean; she tells a colleague she became a nurse to help people. She’s just smarter than some doctors and weary of the system. In this episode, things go wrong with her patients but instead of accepting the situation, Jackie doles out her own brand of vigilante justice (maybe she learned a few things from Tony Soprano?). She’s flawed and some of her actions are unethical and outright illegal, but you’d want her at your bedside if you ever have to check into the hospital. This is largely due to Falco’s grounded performance, for which she can expect Emmy and Golden Globe nominations next year. Falco makes every look, line and gesture count and is commanding even when she’s not speaking. Like another show about a rule-breaking, pill-popping medical professional, House, this show is titled the way it is because the most fascinating thing about it is the lead character, not the patients’ cases. The supporting cast is also noteworthy. 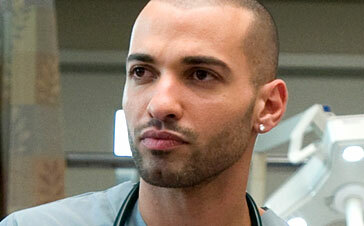 I was excited to see the magnetic Haaz Sleiman show up as Jackie’s co-worker and friend, Mohammed. Sleiman made a really strong impression as the foreigner who befriended Richard Jenkins in last year’s The Visitor so his presence is very welcome here. Eve Best is amusing as the droll Dr. O’ Hara but so far Anna Deavere Smith doesn’t have enough to do as the hospital’s administrator. Will you watch Falco shed her Carmela persona? Tune in tonight on Showtime or just click here (sorry, it doesn’t work internationally) then tell me what you think. UPDATE: Entertainment Weekly reports that Showtime has already picked up the show for another season after the pilot debuted to record numbers. Thanks, PCN. We’ve been looking forward to this. Sounds like we’re in for a treat. Will I watch? Are you kidding me? Falco is Falc-ing teriffic! This will be a huge hit for her, I’m sure! Ha ha! Good one, Reader#9. Welcome, francislewis! I’m happy to hear from another Jackie fan. Let’s keep spreading the word!